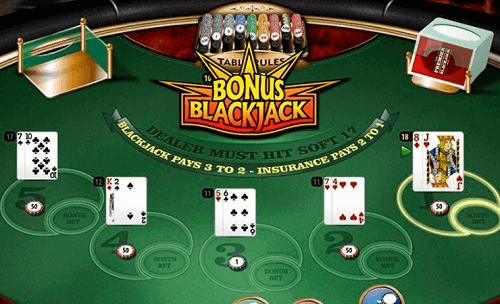 Bonus Blackjack is an interesting game that gives a new edge to a classic casino game. The game developed by Microgaming is giving players in South Africa a great opportunity to rediscover the classic game. Obviously, it is the Bonus feature that has made the game so popular. For gamblers to get a good understanding of what the bonus feature is and how it works there is a need to get a brief background of the game. The game of blackjack traces its routes to Europe where it was once called vingt-et-un. This translates to 21. However, Bonus Blackjack is based on the American version of the game. Just like all other versions of blackjack the objective is to beat the dealer’s hand by having a hand not more than 21. In this game, the dealer has to stand at a soft 17. Hands in the game are valued by adding the cards that make up the hand. All cards are valued at their pip value. The Ace has a value of either one or 11. Picture cards have a value of 10. Getting a 10 value card and an Ace is known as a blackjack. In this version of blackjack, the dealer gets a hole card. This is the up down facing card. When the other card is a 10 value card or an Ace the dealer can look at the hole card to determine if his hand is a blackjack or not. The Bonus Feature in the game is in the bets. Besides betting on the outcome of the game, players can also bet on the cards that they get. The bet will pay players getting a particular set of cards as their hand. When the player’s first two cards are the Ace and Jack of spades the payout is 50:1. Any other pair of an Ace and Jack of identical suits will pay out 25:1. The pair in different suits will pay out 5:2. Bonus blackjack uses the same platform used for the development of the Gold Series of Games from Microgaming. Therefore the maximum bet accepted per play is 1,000 credits. This game plays with only 2 decks of cards which make the game very rewarding. As compared to versions with more decks of cards. Find out about the best online real money casinos and casino games in South Africa with Casino ZA.